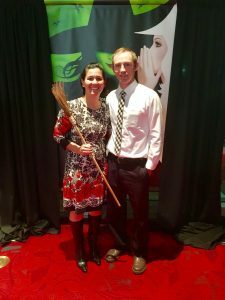 At the last minute, Cody and I went to see Wicked: The Untold Story of the Witches of Oz at the Performing Arts Center. We loved the production! We both got the chills when Elphaba sang “Defying Gravity.” This part of the play was so powerful for me because she realized that all the external things she imagined would validate her as a person, the things that would help her feel accepted and valuable, were actually just a figment of her imagination. All along the Wizard of Oz was “smoke and mirrors” and using the mob mentality of the Ozzians to feel “wonderful” about himself. 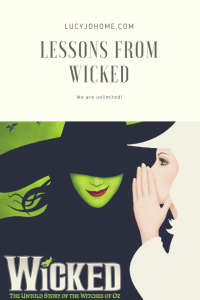 Elphaba was the one with the power to do something good all along. She would defy gravity because she knew who she was and nothing could take that away or bring her down. Her possibilities were UNLIMITED! Even as I write about it, I know that this is truth. We are all unlimited, if only we would believe it were so. The wizard of Oz tells Elphaba that truth is simply the majorities opinions, and I can see how this mentality has tainted even me. We are looking for our “wizard” to make us feel good about ourselves: friends, family, social media, but the fact is only we can truly convince ourselves that we have value just being ourselves. The people I admire defy gravity by living authentically and with gratitude for the powers for good they have. I hope I can always be numbered with them and Elphaba! P.S. If you have not seen this play, you should.